Moving on right into Part II of the Casual Connections posts. Old Navy's skinnies sale is still going on until October 2. Skinnies are starting out at just $19. Rolling right into those casual events that promote a little style confusion. I decided the include the coated jeans (which have somewhat of a leather look) and the tuxedo denim. Scenario 3: Food Truck Date - A new kind of date, food trucks provide a fun and different way to get to know someone or have a date night. Those darn food truck dates are so confusing though. You will be outside and most likely standing up while eating. I decided to work the coated jeans which are apart of the Old Navy's Rockstar collection. They give that night time feel with that casual comfort. I paired with a dark colored blazer just in case of the night time air got chilly and if it got a little to real with the food truck goodies. Nothing is worse than spilling something on a white top. Scenario 4: Casual Fridays - Before I was a full time blogger, I worked a regular 9-5 like everyone else. Apart of American office attire culture, casual Fridays have become that one day when people take advantage of being in more comfortable clothing. Just like in most situations, somebody has to take casual Friday too far. Folks seem to forget quickly that they are still going to work. I have seen some of worst inappropriate casual Friday attire from shorts, to sweatpants, to just looking like you literally rolled out of bed and picked up the shirt that the dog was sleeping on. Help them! Anyways, I thought the tuxedo jean was the perfect way to keep it cute and classy for work on those casual days. With a tuxedo stripe down each leg, these are literally the perfect dress up jean. This post was sponsored by Old Navy Canada. All opinions are 100% my own. I'd definitely pair my skinnies with the sequin cardi!!! Love it! Love both of these looks.. I have to run to Old Navy for these jeans, especially at this price. Such a good look! I haven't had luck with ON jean fits in a while so this sale and this contest are good reasons to try again. I'd pair the snakeskin print super skinnies with black booties, sheer layered camis, and a moto jacket. I would pair mine with a classic peacoat and statement bag. I love just the plain black skinnies because they are so versatile! Those coated jeans are LOVE. I pretty much LIVE in ON black skinnies - I have to buy new ones every few months though because they wear out in the thigh from my chub rub. They are the best fitting pants I own! I would pair a boyfriend shirt (basic white cotton with french cuffs) with it and a pair of sparkly silver flats. I would pair my skinnies with the ON Women's Plus Graphic Sweater in color Fox. It is cute, funky, foxy and totally me, Fall Chick. CLassic peacoat pairing for me! I NEED to shop with you! You put everything together so well. :-) I love the skinnies by Old Navy and you can go down 1-2 sizes!! Love the Striped Chiffon blouse with the Zip Front Cardis with Tuxedo Striped Skinnies. So Cute! I love love love love the 1st outfit. Its something that I can definitely wear to work. Would pair with a fitted blazer, scoop neck tee, a statement necklace and some Tieks. Btw, love your hair! I would pair either one with an off the shoulder top and some wedge tennis shoes. I also like how they are already done. I would wear them with my favorite cardigan and a black top. I really love the polka dot pants I saw at Old Navy. The Women's Plus Belted Open-Front Cardis in blk with a stripped under shirt is something I'd definitely pair w/ my skinnies. I really like the tie waist blouse in pink. I'm a college girl so I would pair the pants with some moto booties and leather jacket. 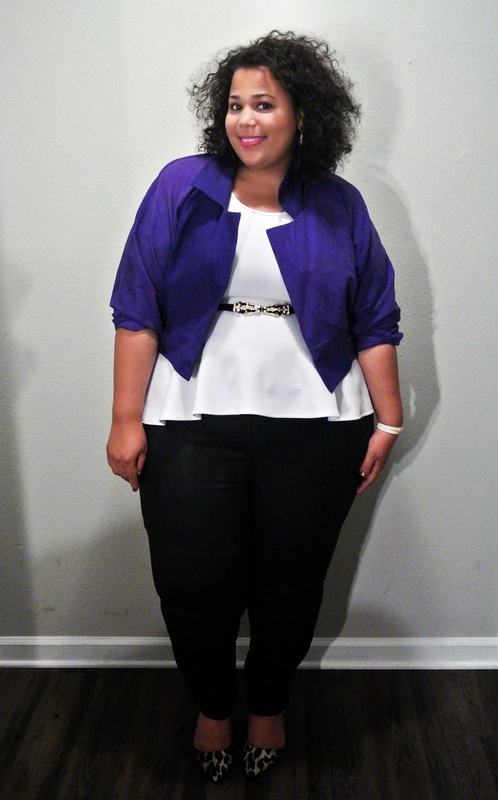 I like the purple blazer, or would it be considered a crop jacket? I would pair a city tee wi a v neck cardigan with a pair of skinny's! How are the fit of the jeans? Run big, just right, or cut small? I would pair a biker jacket with my skinny jeans and a printed tank. I would pair a black peacoat with a white shirt underneath and a pair of Finding Neon skinnies. I'd wear my skinnies with the old Navy fox sweater. I'd wear my skinnies with the polka dot tee and the tan boots! I would love one of the bird print jersey dresses (I'm a sucker for a good print) or a peacoat. Both would be great for fall! I would wear my Old Navy Skinnies with the Blue Belted Open Front Cardi with a simple white cami and the brown wide calf boots! I love the skinnies. I would love to pair the dark denim skinnies with a mustard peacoat and cognac wide calf boots. Thanks for the giveaway! zvwillis@hotmail.com. I would wear my skinnies with a simple white shirt and my chucks! I spotted an anorak that I would rock with my skinnies. Now I do love that sequin cardigan. I would pair my skinnies with the sea salt crepe henley tank and the black jack sequined boyfriend cardi. I am loving the Crepe Military-Style Blouses! All three colors would pair perfectly with the skinnies! I would pair my old navy skinny jeans with a fitted leather jacket and leopard print booties. I would pair with the 3/4 sequined dot t-shirt !!! I'd wear the Chambray shirt. Love the Casual Friday look!! My organization nixed Casual Fridays just because of what you noted - most people don't really understand what it's supposed to be! Ugh. I wish I could rock those tuxedo jeans to work! I would pair my skinnies with the embellished sleeve tee! Fox sweater with black skinnies and a jean jacket. I would love to wear the crepe military style blouse with a pair of skinnies. I wear my skinnies with a nice strappy heel! :-) I love your outfit ideas as well. I love the coated skinnies in Wine. I would pair them with the v-neck cap sleeve sweater in black and some black booties. I love On skinnies! The coated jean would go PERFECT with my Phillip Lim blouse!!!! Hope I win, love Old Navy's pencil skirts. I would pair Old Navy skinnies with that adorable fox with glasses sweater they have right now. Adorable! Great giveaway! 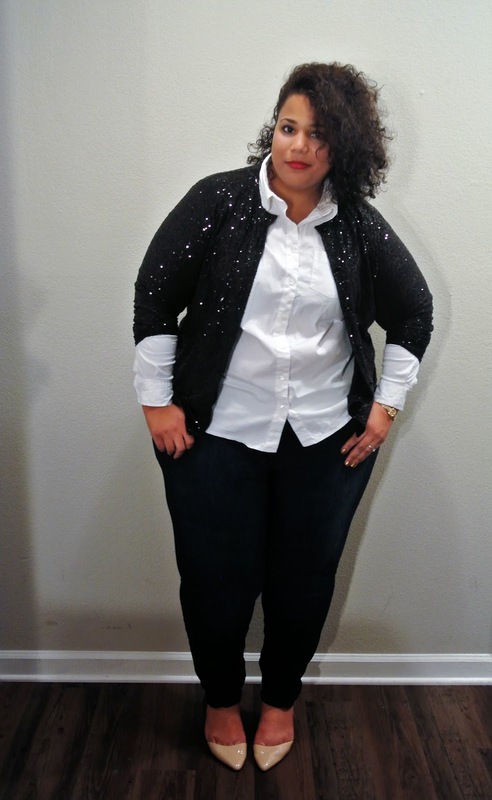 I would pair the skinnies with a white tee and the Old Navy Plus Sequined Boyfriend Cardi! Both of these looks are FAB! I would pair my skinnies with an Army Fatigue vest, basic shirt, and cute wedges for a comfy night out!!!! I would also dress it up with a nice blazer, cute heels, and nice tank with cute accessories!!! Hope I win!!!! Love your style! So inspiring! I would pair my skinnies with the old navy gray boyfriend cardigan! I love that lil purple jacket! I'd pair them with elaborate sweaters and boots for campus wear! I would pair it with some ankle high boots and a great sweater! LOVE your style!!! 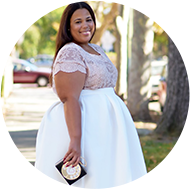 I didn't know Old Navy sold plus sizes! I've been skeptical about their jeans but I shall give em a try now! Thanks! I'd wear with a high low tunic and a statement necklace. I love skinnies with oversized breezy chifon shirts. In the fall, I wear them with loose tops and tight boots. I LOVE the tuxedo stripe skinnies. If wear them with a pair of boots and a comfy sweater. Love your style, you're so inspiring!! I would pair my skinnies Fox Graphic Sweater. I love having a playful style with skinny jeans. I've been eyeing the striped chiffon blouse in red! and the classic peacoat in grey. I'd rock those skinnies with Old Navy's layering tanks, and boyfriend cardigan. I'd finish it with an obi belt, and boots! I love some of the new tops that ON has for fall. They look so comfy and would look awesome with a pair of skinnies. You never can have enough jeans! I am in love with the camo pants! I love skinny jeans and flats with a button down shirt and a cardigan. Love the blazer with the belt! I would pair my Old Navy Skinnies with a embellished tank and a waterfall cardigan. I would pair these skinnies with an off the shoulder white top, leopard flats and a cute scarf! I think this will make a cute airport look! Love the coated skinnies and the snakeskin print too. I like that it's kind of a subtle snakeskin with the black and grey. I'd wear them with the black side-shirred tee and ankle boots.